The Simplanum app is available on iOS devices and can be found on the app store. The app aims to increase users’ productivity and planning abilities. 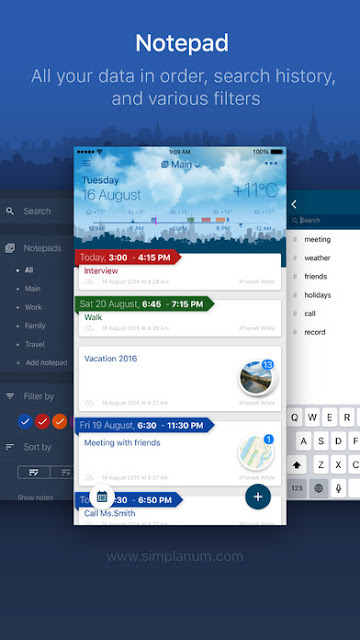 If you want a one-stop shop for an easy way to organize your life on a simple interface, this app could be your newest life buddy. It simplifies and collates all aspects of planning and being productivity with the feature of an all in one platform to use the calendar, write notes, look at notifications and make use of the Cloud. The ability to synchronise the app to the Cloud means that users can easily switch between devices and update their lives in a multitude of ways. This expands the opportunity to use the app on a desktop, laptop and mobile devices depending on which ones are most accessible to you at the time. So if you happen to be in an environment where you are not able to use your phone or have no access to a computer, you can still update your Simplanum. It also works with any file attachments so there will not be the risk of getting the dreaded “file error” messages after spending time creating a note message for yourself or a calendar entry. Voice recordings are also an option so you do not have to type away at your device. For those who like to plan ahead, a yearly weather forecast is available, so users can pre-plan events and avoid the chance of being caught in adverse weather conditions on a special day. To improve productivity, the Simplanum enables the use of a checklist for each event so it is easier to know your progress and judge how far you have left to go. Note or application entries can be password protected and with Touch ID. This is helpful for those who may use a work phone or simply want to ensure certain people are not aware of their personal plans. There is a limited free version of the app, which does not offer all of the features the fuller versions have. To enjoy the benefits and gain more features, there are different thresholds of monthly subscriptions. This can make the use of the app customizable for those who may feel that they do not need all of the features. Ranging from $0.99 a month to $6.99 a month, it is completely up to the user how much of this app they want use. 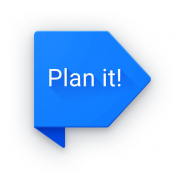 The Simplanum makes being prepared feel like light work and takes away the complications that comes with using multiple app to organise yourself. If you prefer a simple act that will make the whole task easier, then Simplanum is the app for you.